Ultimate Performance has it all, so where do you begin? First, Ultimate Performance is exactly as it's name implies, the ultimate in performance, durability, styling and warranty coverage. Ultimate Performance carpets are made from PermaSoft™ Plus, the new Solution-Dyed nylon fiber that has a cottony soft feel, and is styled for comfort, elegance and today's sophisticated consumer. It's easy to take care of and easy to live with. Plus, it has advance stain, wear, and texture retention warranties and a special added feature; Magic Fresh, the exclusive, self-renewing, odor-destroying carpet treatment. Magic Fresh is formulated to keep your home feeling fresh. Ultimate Performance warranties go beyond the industry norm, we even guarantee that should your carpet ever get stained we will pay for the carpet. 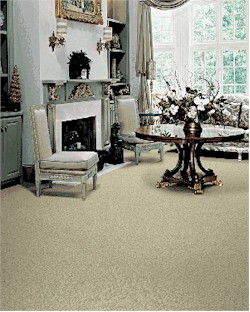 This carpet will give you style, luxury, and absolute peace of mind. The Luxury Collection™ by Hollytex is considered to the the ultimate solution in elegant styling for all rooms in your home. Created to enhance the full rich lifestyle of today's active family, Luxury Collection™ carpets are engineered for durability and performance, and are crafted from 100% STAINMASTER® XtraLife® fiber, which brings a whole new level of elegance to your home environment. Some carpets are crafted from STAINMASTER® Tactesse™, the new, soft, carpet yarn that provides excellent durability plus enhanced comfort underfoot. Additionally, all the new selections are backed with LuxuryBac™, a Beaulieu exclusive, the backing that will not damage walls or baseboards, contains spills for easier and quicker clean ups, has stronger and less visible seams for perfect installs, and has a unique ten year no-wrinkle warranty. Dramatic, Modern, Contemporary. An elegant use of materials creating an even newer sense of style. This is Hollytex Commercial. Where great products exceed your specifier needs. This is Hollytex Commercial. Where form doesn't just follow function it surpasses it. This is Hollytex Commercial. Where dramatic graphic patterns and state-of-the-art textures meet nylon road and go way beyond.